In the afternoon hours of April 6th 1972, North Vietnamese Forces launched the largest offensive since Tet in 1968. With the help of local guerrilla, NVA Forces simultaneously launched offensive on every major South Vietnamese Installation and Provencal capitals with large amounts of Russian supplied T-34-85's & T-55. NVA Forces have also utilized their small amount of MiG-21s & AN-2 Colt Aircraft. Control of Pulau Island was handed over to South Vietnamese Forces in December 1971. Since then revolutionary sentiment has been growing due to the lack of action by the South Vietnamese Forces. We believe that over the four month period large caches of supplies, armored vehicles, heavy artillery, and Surface to Air Missiles were smuggled onto the island & used during the offensive. Only a single Platoon of ARVN forces managed to evade capture and be evacuated before the Island fell. All others are believed to have been captured and executed; Viet Cong hit squads also managed to execute a vast majority of the civil officials residing in the cities and villages. We have lost complete control of the Island chain. Alpha Company, 1st Battalion, 7th Cavalry Regiment is to accompany the 4th Battalion, 147th ARVN Marine Regiment and regain control over the island. ARVN Marine Reconnaissance platoon has landed on the southern most tip of Pulau Monyet and begun conducting clandestine reconnaissance of the island. According to their intel, the majority of NVA forces have left the Island to assist with the offensives on the mainland. 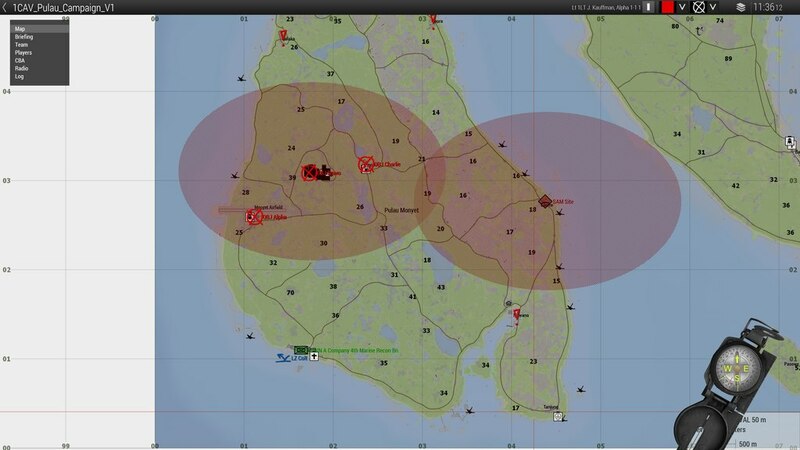 Control of the Island has been handed over to the NLF, while small contignents of NVA Forces remain to operate and guard the Airfield and Surface to Air Missile installations, which now cover a majority of the island and block the ability to use our fixed wing assets to neutralize Vietnamese Hard points. We are still able to utilize our rotary wing aircraft as long as they operate below 30 Meters from the ground (10 Meters above the Canopy). Since this overlapping system of Surface to Air Missiles has been installed on the Islands, it is believed that two Russian MiG-21's have landed on the Island and intend to operate within the heavy cover of the Surface to Air Missile batteries. Positive Identification (PID) is required prior to engagement. PID is a reasonable certainty that the proposed target is a legitimate military target. If no PID, contact your next highest commander for decision. Do not engage anyone who has surrendered, or is unarmed or wounded. Any requests for fire support or close air support within 600 Meters of a civilian center must first get authorization from commanding officer. Pulau Monyet is delcared a free fire zone. 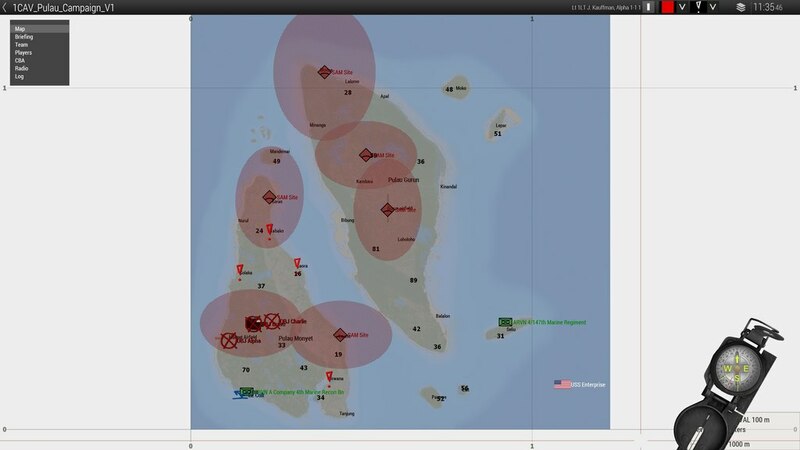 Our First Objective (OBJ Alpha) will be to conduct an air assault on the Island of Pulau Monyet. A reconnaissance Platoon of ARVN Marines have secured an LZ. Rendezvous with them, then move to OBJ Alpha. Search the Hangars for MiG-21's, and destroy them. From there, 1st Platoon is to move northwest and neutralize the largest Anti-Aircraft battery on the island which includes a single Surface to Air Missile (OBJ Bravo). Depending on time, 1st Platoon will then move onto OBJ Charlie, where high altitude Ariel reconnaissance has spotted a large concentration of fuel trucks, where the NVA is attempting to gather up all the remaining fuel on the island to run their armored vehicles. 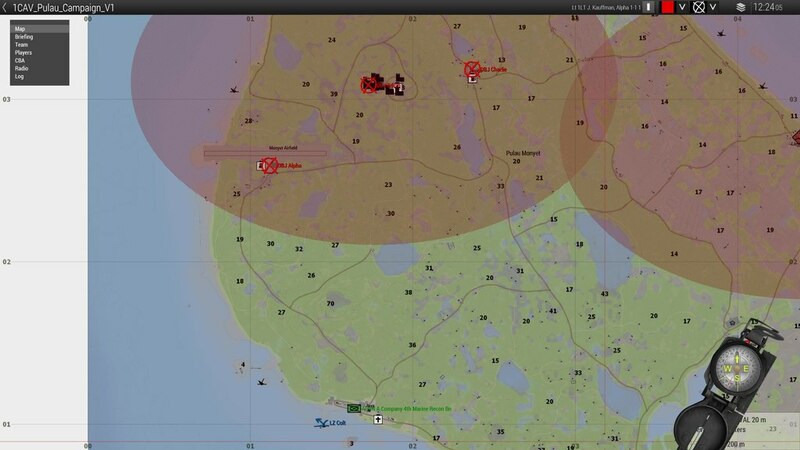 All requests for Close Air Support/Medevac/Resupply/Insertion are to go to Mako 1-6 on FREQ 60.0. Mako 1-6 will contact Rattler 1-6 on FREQ 50.0 to request an asset to assist 1st Platoon as necessary. Once the asset is in the area of Operation for Mako 1-6, Infantry can contact the bird via CAS Net FREQ 45.0 to guide in the bird/direct close air support. If an infantry element is in threat of being overrun and requires immediate assistance, they may declare a "Tactical Emergency" to Mako 1-6, who will then have Rattler 1-6 redirect all available air assets to Mako 1-6's Area of Operation to prevent the unit from being overrun. PRIMARY TASKING: Close on OBJ Alpha, locate and destroy MiG-21s before they can take off. TERTIARY TASKING: OBJ Charlie, Locate & Destroy enemy fuel trucks before they can finish collecting the diesel reserve. 71st AHC is to be flying air support for 1st Platoon. PRIMARY TASKING: Inserting 1st Platoon into the AO via UH-1H Hueys. Gonna comment here. I'm not able to make the op on Saturday, hanging out with my girlfriend. Nevermind. Had to cancel, she had plans. I'll be there.